Apple’s overhaul of its iPod lineup didn’t stop with new versions of the iPod nano and shuffle. On Wednesday, Steve Jobs also unveiled the latest iPod touch, which largely retains the look of previous iPods while adopting more iPhone-like features. 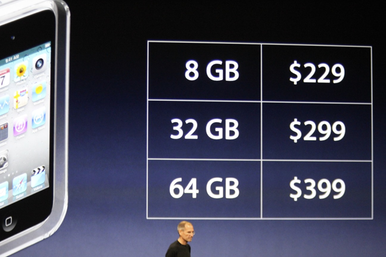 Chief among those features is the addition of front- and rear-facing cameras to the latest iPod touch. The device also adds support for FaceTime, Apple’s video chat feature that was first introduced to the iPhone 4 this summer. Jobs offered few details during his iPod touch presentation on how a device without a phone number like the touch will be able to place calls to other devices. However, it’s worth noting that FaceTime requires a Wi-Fi connection to work on the iPhone 4, and that it’s very easy to start a FaceTime session without ever calling anybody. As for the rear-facing camera added to the iPod touch, it can also take pictures and record HD video. Thanks to that capability, touch owners will be able to run the mobile version of iMovie; previously, Apple’s video-editing app only worked on the iPhone 4. 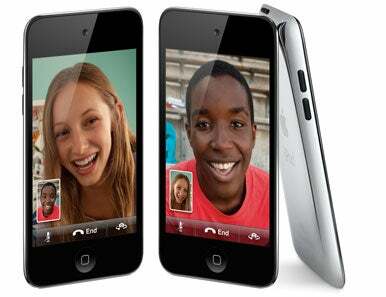 New cameras and FaceTime support aren’t the only iPhone 4 features found in the latest iPod touch. The new device also adopts Apple’s Retina display technology, giving it a display with a resolution of 960x640—four times as many pixels as the previous touch models. The new touch also gets an A4 chip of its own, which should boost battery life on the device. Apple’s iPod touch specs promise 40 hours of audio playback and seven hours of video playback on the new touch. Finally, the touch features the same 3-axis gyroscope as the iPhone 4, allowing for faster and cleaner-looking apps and games. Indeed, games played a central part in Jobs’s iPod touch demonstration on Wednesday. The CEO noted that 1.5 billion games have been downloaded from the App Store onto the iPod touch alone; Jobs even managed to slip in a quick boast noting that the device is outselling both Nintendo and Sony worldwide in the portable gaming market. Furthermore, the newest iPod touch will ship with iOS 4.1 installed, complete with Apple’s new Game Center software that enhances multiplayer gaming. In its latest iteration, the iPod touch has gone on a dieting, sporting an even slimmer figure than before. The previous generation came in a 4.3-by-2.4-by-0.33-inch enclosure and weighed in at 4.1 ounces. The latest touch measures 4.4-by-2.3-by-0.28 inches and weighs 3.6 ounces. The iPod touch is available for pre-order right now from Apple’s Website in three flavors: 8GB for $229, 32GB for $299, and 64GB for $399. Apple says the new models will be available next week in Apple retail stores. Updated at 2:05 p.m. PT with new information throughout.